We formulated this smoothie recipe based on the principle of “synergy.” The nutrients consumed together enhance each others benefits, so the whole nutritional effect is greater than the sum of its parts. I have prescribed this recipe for several hundred school-children and their parents, and we drink it ourselves four to five mornings a week. It’s a powerful performance booster for working parents and school-children. Combine all the ingredients and blend until smooth. 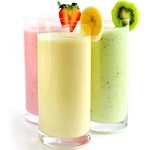 Serve immediately after blending while the mixture still has a bubbly milkshake-like consistency. Because fiber steadies the absorption of carbohydrates and therefore contributes to a steadier blood sugar, we suggest using rich sources of fiber, such as flax seed meal (i.e. ground flax seeds, containing both the oil and fiber), although flax oil has a more palatable consistency than flax seed meal. For additional fiber, if you don’t mind a grainier texture, add 1 tbsp. or more of oat bran. This family-size recipe makes four, 16-ounce servings (approximately 550 calories per serving). Adjust the recipe to the desired taste and volume. Besides being tasty, it’s nutritionally balanced, with each serving containing approximately 25 to 30 grams of protein, 55 to 60 grams of carbohydrates, 8 to 16 grams of fat (mostly healthy omega 3’s), and 5 to 10 grams of fiber. Enjoy! Makes one 20-ounce serving (approximately 550 calories).